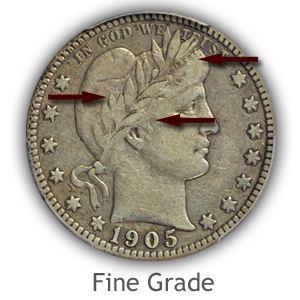 Judging the condition of your coins is presented in the grading Barber quarters video along with descriptions highlighted in the close-up images. It is necessary to examine these old quarters closely - Date | Mintmark | Condition - all contribute when determining value. Developing an eye to detect an overly worn; minimal value coin from a key date; moderately worn prize follows a process. 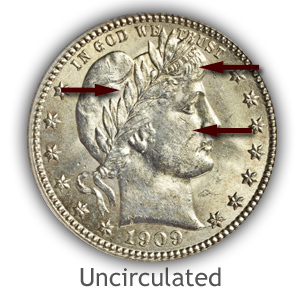 Mint state (like new) coins are identified from circulated (worn) coins and different degrees of wear are judged. Important and necessary points to separating these grades are highlighted. To this day there is a large supply of Barber quarters available to collectors. However, in all cases this large supply falls into the well-worn Good grade. Finding a coin in moderately worn or better condition is finding a premium value collectible. Heavily worn Barber quarters have lost the intricate fine details of the design. 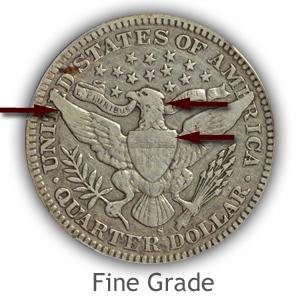 The study of a true mint state coin is needed to properly grade a Barber quarter. Highly prized and valued the "as minted" coins show no signs of wear to the surface. Judging and recognizing this grade is a process of inspecting the highest points of the design for any signs of wear. Also necessary is the presence of mint luster over all parts of the design. Mint state grade Barber quarters are quick to lose the delicate mint luster on the reverse design. The many fine edges and tops of letters are very prone to contact. A very slight amount of wear is seen on the coin's design; it now grades in the Extremely Fine condition. Although detail is missing, it is confined to only small areas and has removed only minor amounts of metal. 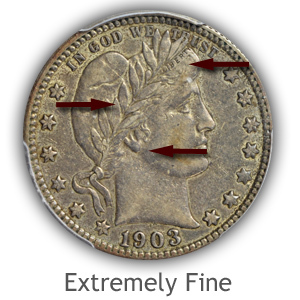 To grade a Barber quarter as Extremely Fine it must portray a sharp distinct appearance. Fine details such the letters of "Liberty" on the obverse and the motto "E Pluribus Unum" on the reverse remain crisp. As a side note: "E Pluribus Unum" translates to "out of many, one". It is the motto on the Great Seal of the United States and is found on many US coins. 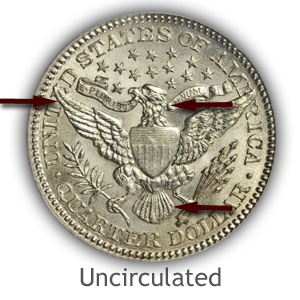 Unmistakable are the signs of wear to a Barber quarter in the Fine grade. However much of the major details remain giving a pleasant appearance. A wreath is seen and distinct cap is visible and on the reverse most of the arrow shafts are clear. Barber quarters wear well and in Fine condition have an appeal and value to many collectors. All letters of Liberty are readable, including an often week "ER" and "Y"
Although the portrait on the obverse and eagle on the reverse are worn smooth; boldness of the design; stars, lettering, date, olive branch, arrows and ribbons are recognizable. 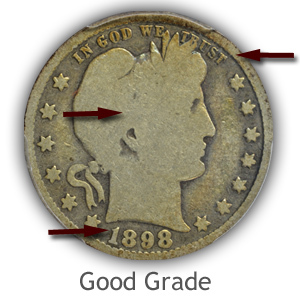 Barber quarters graded in Good condition still retain appeal despite loss of fine detail. Inspect the ribbon for any letters of the motto, often a few remain confirming the Good grade. Grading Barber quarters with a focus on separating any in conditions above the Good range quickly finds the premium value coins. Most surviving Barber quarters are in circulated condition. Most of these survivors are heavily worn and hover in and around the Good grade and close in value to their silver content. There are a few of these very worn coins known as Fundamental Rarities, dates and mints so elusive they command large premiums above their silver content. The top three key rarities are the 1896-S | 1901-S | 1913-S all highly valued. There are others in the range of $15 to $100 well worth checking each coin as to date and mint mark. Visually separating the nicer condition coins begins to find any highly collectible and valued piece. 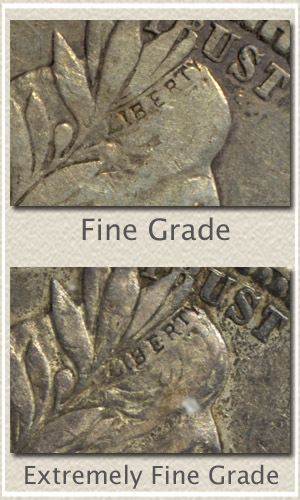 All Barber quarters in the Fine grade are sought by collectors, minimum values on the charts are well above silver value. Each coin is visually better and identified by the presence of "Liberty" clearly readable on the headband. Looking even closer at the details of the coin is when subtle discoveries identify a condition rarity. A distinct band, including definition of both the top and lower edges of the ribbon and with "Liberty" bold, indicates the Extremely Fine grade Barber quarter. At this point you have found a coin in well above average grade for the series. Certainly uncommon and for many dates and mints a scarce example. 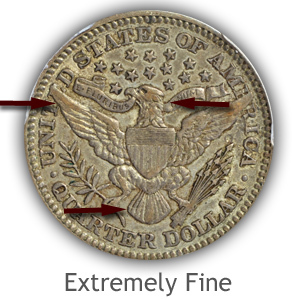 If you have a circulated Barber quarter, judging condition and determining it is a condition rarity is the best chance of finding premium value. 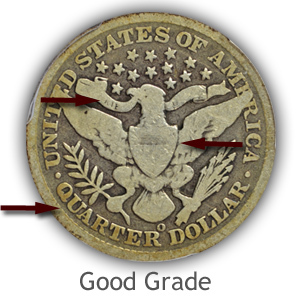 Many value opportunities are found in accurate grading of your Baber quarters. Index of grading old coins videos. In-depth descriptions of the elements to judging condition are highlighted in the close-up images and videos. 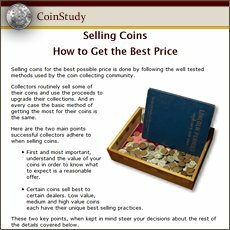 Follow the video, compare your coin to the images and judge the key elements described in the descriptions. Combined, these form the basis to determine the value of Barber quarters. Value charts of all dates and mints listed. 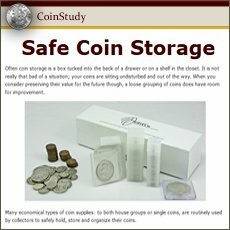 Image links identify each US coin series from old pennies to gold coins. Each lead to value charts, descriptions and images identifying the important mintmarks and how to judge condition to arrive at an accurate value.